George Mallory, the British mountaineer, was once asked why he climbed mountains. His response is said to be 'because it's there'. Alex Honnold, the subject of the documentary Free Solo, seems to have a similar mindset when it comes to climbing large rocks with no ropes or other equipment (what is called 'free solo climbing'). George Mallory, I note, died on Mt. Everest at age 37 attempting to climb the world's tallest mountain, with debate whether he actually reached the summit or not. Honnold is as of this writing 33, and his attitude towards death is quite casual to almost nihilistic. Essentially, Honnold's worldview expressed in Free Solo is 'if I die, I die, so what? ', but more on that later. 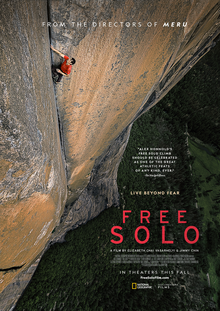 Free Solo covers his training on various cliffs around the world, along with his various talks and remembrances of things past, such as his parents' divorce and fellow free soloists who have died. Along with his associates and something of a girlfriend Sanni McCandless, 2016 is spent working towards his goal of free solo climbing El Capitan, the Yosemite Park monolith. Not even an ankle injury during his training will eventually stop him from going up on June 3, 2017, almost on the spur-of-the-moment after not going up earlier. His first thwarted effort was in part connected to his unease about the cameras his associate and Free Solo co-director Jimmy Chin (along with Elizabeth Chai Vasarhelyi) had on him. Free solo El Capitan he climbs, with various cameras capturing his rapid ascent up El Cap both with cameramen located at various points and on the ground. Once done, he smiles, Sanni returns and there it is. I thought to myself that Free Solo is what Grizzly Man would have looked like if a camera crew had followed Timothy Treadwell before he and his girlfriend were mauled to death by bears. The Alex Honnold I encountered in Free Solo is not someone I liked. He strikes me as not aloof but as distant as those peaks he strives for, his passion more for the methods than the actual achievement or joy that comes from it. He's a bit of a loner, perhaps as his mother Dierdre Wolownick speculates with some kind of Asperger's Syndrome, who by his own admission sometimes has a 'bottomless pit of self-loathing' and didn't start hugging until he was 23. The hugs apparently started coming because he saw that this was common among others. Honnold does not seem to have a death wish but he seems not to comprehend why people put happiness as important. Life is about performance, what you do he believes, not personal happiness. Free solo climbing allows him to have that goal, that mark on the world, and other things are not worth noting. Honnold's climbing hero and training partner Tommy Caldwell at one point asks if Honnold marks anything personal in his various diaries. Honnold seems almost genuinely puzzled about this inquiry, for his diaries note the technical aspects of climbs, not so far as I could tell what he feels about things. His relationship with Sanni too is something he can let go of: she is emotional when remembering his reaction to the widow of another climber when her husband died. 'What did she expect? ', seems to be his reaction. One aspect of Free Solo that I was surprised by was on both how the Chin seems to be almost part of his own movie, less a chronicle of Honnold and his climb up El Capitan but about 'the making of Free Solo and the chronicling of Honnold and his climb up El Capitan'. Chin comes across almost as Honnold's personal videographer than just someone interested in showing others this man and his passion. The film seems very interested in highlighting the technical prowess of the production, going into the nuances of where the cameras should be. To my mind, this comes close to being narcissistic both for Honnold and Free Solo itself. Early on there's mention of Honnold's charitable work but it's quite slight to where one wonders why it was mentioned at all. Perhaps to make our remote figure look more human? Free Solo has as its highlight the climbing, particularly when Honnold rises up El Capitan, the vistas and knowledge Honnold is holding on with just his hands and feet making things at times highly uncomfortable. Sometimes even the training scenes put the viewer on edge and are highly uncomfortable. As a side note, is that part of the wide appeal of Free Solo, that we may see someone with one misstep or miscalculation plunge to their death? The Alex Honnold in Free Solo would have no feeling on dying, so perhaps we shouldn't either, but I digress. Curiously, when it comes to Free Solo, I feel a certain sense of bullying. I didn't like it. I was not impressed with it or with Honnold apart from some remarkable visual moments and sense of suspense. Yet it seems to have a passionate core group of fans who find any criticism, no matter how mild or even logical, to be an affront on humanity. I feel as though I have to love it and think Alex Honnold among the Greatest Men in Human History. I feel the same bullying coming from A Star is Born 4.0, so to be fair, I'd sooner watch Free Solo than A Star is Born 4.0, so there's that in its favor.